It probably won't rival any of Tony Stark's tech, but nevertheless, this sounds awesome. After rumours and some nifty concept renders teased its existence, Samsung has now officially confirmed an Iron Man-themed Samsung Galaxy S6 Edge is on the way. 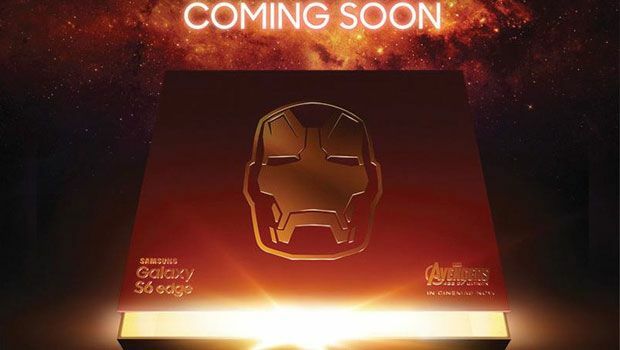 Samsung has taken to Twitter to officially tease that the Iron Man version of the Samsung Galaxy S6 Edge is 'coming soon'. The image, shows a red box featuring Iron Man's golden face with the Avengers logo stamped on the bottom. The message on the tweet simply said: "Coming Soon (*Detailed availability in markets may differ by region)". That's all we have to go on really. The phone's launch and availability are still to be confirmed, but the fact Samsung flags up multi-regions suggest it might appear in countries all over the world. This isn't the first time we've heard of the Iron Man S6. Samsung reportedly mentioned plans earlier this month, before one enthusiastic designer whipped up some fancy renders of the device, featuring an S6 handset in a red and gold Iron Man-esque paint job. Apart from the respray though, we don't expect any changes in the hardware. Like the original version, the Iron Man S6 Edge is expected to adopt a 5.1-inch 2560 x 1440 pixel QHD display which curves around both the phone's left and right-hand edges. Samsung has yet to confirm detailed plans for the Iron Man S6, but considering Avengers: Age of Ultron is currently dominating the box office, we expect to hear more news sooner rather than later.